More than ever, Range Rover represents the pinnacle of luxury travel, making every journey a treasured experience whether driving or being driven Today, technology drives the next major step for the Range Rover, with a plug-in hybrid electric powertrain providing sustainable luxury with new levels of efficiency and capability complementing its refinement and desirability. To experience tailored Range Rover luxury and performance in its most dynamic form, customers can now savor the enhanced Range Rover SVAutobiography Dynamic – the most powerful production Range Rover to date. The output from its supercharged V8 gasoline engine is up to 557hp delivering 0-60mph time of 5.1 seconds (0-100km/h in 5.4 seconds)5. Striking design revisions include an exclusive Graphite Atlas mesh grille design with chrome inserts and a revised rear bumper with integrated metal tailpipe finishers. Following the announcement of the new Range Rover Sport plug-in hybrid electric vehicle (PHEV) last week, the brand’s ICE to ACE journey continues, moving from conventional internal combustion engines to connected and electrified vehicles. 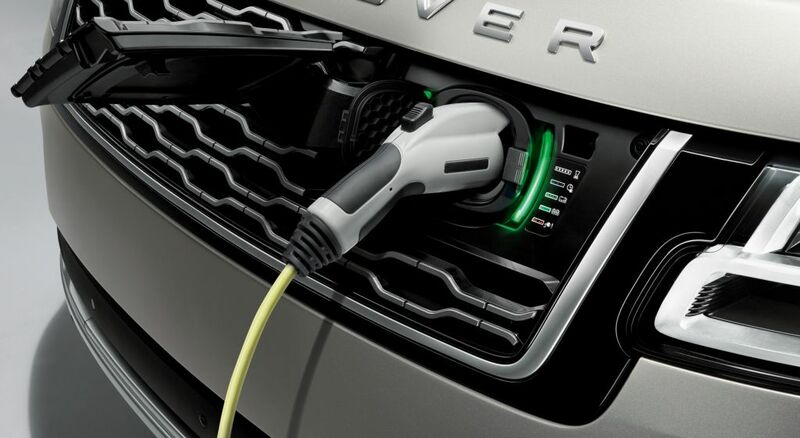 The Range Rover PHEV and Range Rover Sport PHEV models represent the first steps for Land Rover on the path that will see all new Jaguar and Land Rover vehicles launched from 2020 offering an electrified powertrain option. The efficient new Range Rover P400e provides sustainable performance by combining a 296hp 2.0-liter four-cylinder Ingenium gasoline engine with a 114hp (85kW) electric motor. The 398hp total available power output4 – available through the permanent four-wheel drive system – delivers 0-60mph in 6.4 seconds (0-100km/h in 6.8 seconds) and a maximum speed of 137mph (220km/h)5. With an impressive 472-lb. ft. of torque, the new powertrain delivers dynamic performance with traditional Range Rover capability, comfort and refinement. The Range Rover P400e provides an all-electric range of up to 31 miles (51km)3 without the Ingenium gasoline engine running. For the first time, customers choosing the flagship Land Rover SUV can experience zero-emission driving. The powertrain’s precision and control make for serene progress in various conditions and terrains. The Land Rover Terrain Response® 2 technology has a unique calibration to intelligently and precisely distribute torque from the electric motor, which has no creep speed and is able to deliver maximum torque from zero rpm, to all four wheels. This gives greater control during low-speed off-road maneuvers, confirming the Range Rover brand’s outstanding breadth of effortless capability. The Range Rover 2.0-liter Ingenium gasoline engine is longitudinally mounted, with the 85kW electric motor housed in the ZF® automatic eight-speed transmission at the center of the vehicle alongside the 7kW on-board charger. The access point for the cable is at the front of the vehicle, while the prismatic cell lithium-ion battery is mounted at the rear beneath the trunk floor.